Add a healthier European twist to the traditional potato (or alternate veggie) salad with this Dijon Vinaigrette recipe! To potato or not to potato? This is a versatile recipe where you can create a delicious (and healthier) version of the traditional potato salad, or swap in other veggies depending on your nutrition goals. 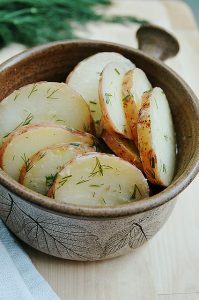 Potatoes rank high on the glycemic index and should be eaten consciously given their higher carbohydrate content, but as long as the skin is left on, potatoes are a good source of fiber, and they’re an excellent source of vitamins B6 and C, packing three times as much potassium as a banana. In fact, the yellow pigment of a Yukon Gold potato is caused by carotenoids, a type of antioxidant. Antioxidants neutralize free radicals and may strengthen the immune system and protect against some forms of cancer. To reduce the total carbohydrate content of this recipe, you can try swapping in cauliflower, turnips, or zucchini! Within this tasty vinaigrette, tarragon leaves lend antioxidants that help fight free radicals in the body, and tarragon also boasts high levels of potassium, iron, Vitamin C, and zinc. Tangy capers pack a ton flavor into any recipe, keeping your meals fresh and interesting! These tasty herbs are storehouses of vitamin A, vitamin K, niacin, and riboflavin, as well as minerals like iron, calcium, copper. Enjoy this quick and healthier potato (or other veggie!) salad with a flavorful twist. 1. Place the potatoes into a large pot of salted water. Bring to a boil over medium-high heat. 3. Drain potatoes/veggies and set aside to cool. 4. Meanwhile, prepare the dressing. Whisk together oil, vinegar, mustard, caper liquid, garlic, salt and pepper in a medium bowl. Set aside. 5. Cut the cooled vegetables into 1/3-inch thick slices and transfer to a large bowl. 6. Add chives, parsley, tarragon, capers and reserved dressing and toss gently to coat.